This page-turning mystery is full of complicated characters and deals with an important topic that is not discussed with teens enough: dating violence. The reader slowly uncovers the dark side of Allie’s relationship with Tripp, her boyfriend who died in a car accident she survived, but can’t remember. Inviting a local agency that works with survivors of domestic violence to speak with teens about the signs of abusive relationships and how to talk to their friends about it is a great complement to this story. 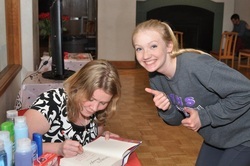 Book discussions are geared for students who have either read the book or will be reading the book. A discussion of the issues and characters in the story and how they relate to issues in real life. 1. Why do you think Allie chose to keep Trip’s abuse a secret? 2. What do you think about Allie’s response to Trip’s death? Was it appropriate? 3. Do you think the school’s/town’s response to Allie following Trip’s death was appropriate given the information they had? 4. Was there anyone who could have helped Allie escape from Trip? Why do you think this person didn’t make the choice to help her? 5. Compare how important “appearances” were to three of the characters in BREAKING BEAUTIFUL and how that shaped who they were. 7. What events in Allie’s life gave her the courage to tell the truth? 8. If Allie was a real person and you knew what was going between her and Trip, what would you say to her? 9. What made it hard for Blake to escape his past? What made it hard for Caitlyn to fit in? 10. Do you think Trip loved Allie? Do you think Allie loved Trip? Maybe you worry about what your teen/parent is reading (or if they’re reading at all). Maybe you worry about opportunities to connect with your teen/parent about the issues you both face in real life. Maybe sharing a book is part of the solution. A look at contemporary teen literature and how it can open a window of discussion for parents and teens about what’s going on in their lives. You are a writer. What message are you sending? In a world where so much of teens’ communication is written through texts, Facebook, Twitter, and other social media, good writing can keep you from misrepresenting yourself and looking like an idiot. A discussion of why everyone is a writer and how basic things like proofreading and thinking before you hit send can save a lot of embarrassment now and in the future. Plot, character, and conflict. 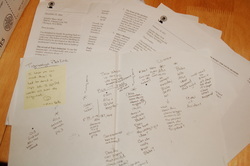 An interactive, multi-media discussion of how to craft a story. 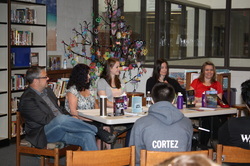 I belong to a group of Northwest Authors who do panel visits for schools and libraries. Contact me for more information on scheduling one of our group visits. For More Information on School, Library, Book Club, or Other Visits. *NOTE: I enjoy doing visits for schools and libraries and I am grateful for the opportunity to talk to and teach kids and teens. As a long-time school volunteer and mom, I am happy and willing to work within your budget, including Skype and Google Hangout visits.